Muscular dystrophy and inflammatory myopathy are muscle diseases that despite their etiological differences share many pathological features, including muscle degeneration, loss of function, and chronic inflammation. Immunological processes induced by muscle injury contribute to the pathology of various muscular dystrophies, whereas autoimmune responses specific for yet undefined muscle antigens are suspected to be the cause of some idiopathic inflammatory myopathies. This chapter discusses the role of the immune system in eliciting immunity and regulating inflammatory responses during acute injury and muscle degenerative diseases. Duchenne muscular dystrophy (DMD) is the most prevalent form of muscular dystrophy. Using DMD as an example, we discuss the role of immune system in the pathogenesis of muscle disease. In addition to the role of innate immunity, we review the literature supporting the elicitation of antigen-specific, adaptive immune responses in DMD, including those specific for dystrophin. We discuss the clinical implications of these adaptive immune responses and their potential in limiting the efficacy of dystrophin gene therapy. 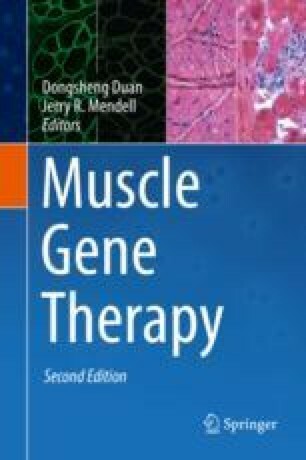 Last, we highlight therapeutic approaches that may be used to inhibit degenerative muscle inflammation and to tolerize DMD patients to the protein product of dystrophin gene therapy.